Sea Turtle nesting season begins May 1st along Juno Beach! Loggerhead Marinelife Center, located in Loggerhead Park, Juno Beach, Florida, is a sea turtle research, rehabilitation, education and conservation center. 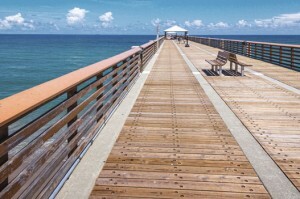 The center also manages the Juno Beach fishing pier, across the street from the park. Established in 1983, the Loggerhead Marinelife Center seeks to promote conservation of ocean ecosystems with a special focus on threatened and endangered sea turtles. Its facilities include a sea turtle hospital, a research laboratory, and exhibit areas including live sea turtles and other coastal creatures. This entry was posted in News on March 29, 2018 by Admin.